The Albion College Marching Band, nicknamed "The British Eighth," represents the college's British heritage and performs for all home football games as well as other events including community and campus parades, pep rallies, and off-campus events such as the Wyandotte "Downriver Festival," America's Thanksgiving Day Parade in downtown Detroit, and other events around the state. Rehearsals during the fall semester take place on Monday, Wednesday, Friday evenings, and gameday Saturday mornings. The British Eighth is open to all students regardless of major or marching experience. Chair-placement auditions are held at the start of preseason camp for part assignment only. 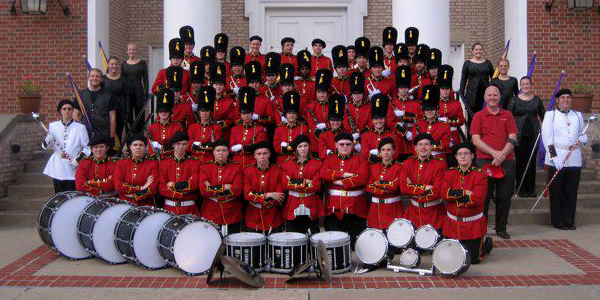 Beginning with preseason camp, held the week prior to the start of classes in August, The British Eighth performs a traditionally "British" pregame and two different halftime shows throughout the football season. Recent show themes have included Wicked, '70s Rock, Monty Python, The Beatles, and Heroes & Villains. The British Eighth is led by the College's Director of Bands, Dr. Samuel McIlhagga. 2017 Marching Band Camp is from Saturday, August 12 through Friday, August 18. A two day Pre-Camp for Percussion and Color Guard is scheduled from Thursday, August 10 through Friday, August 11. More detailed information, specific times, etc. will be available as they are finalized. Interested musicians should complete the marching band sign up form by July 1. For questions or more information regarding the British Eighth Marching Band please contact Director Samuel McIlhagga by email at or contact the Music department.